To knead the dough, pass several times through the widest slot. You probably already know that I’ve been cooking and baking since I was very young. I was soon making elaborate cakes and wowing my parents, relatives, and friends. Yet, despite my great love of Italian food, especially fresh pasta dishes made with fine pasta noodles, I never tried making it until about 10 years ago! And boy, did I ever regret waiting so long to try after realising how easy fresh pastaÂ was to make! All you need is large, fresh eggs, flour, and a rolling pin! OK, kneading and rolling by hand is a wee bit harder, but if you have a food processor and a simple pasta machine like the one in the photo, then it is even more simple! I prefer to roll my pasta until it is very thin! Place 340 g flour and the salt in your food processor and pulse to mix well. Add eggs and pulse until the mixture resembles fine breadcrumbs – it may start to form a dough depending on the moistness [the size of the eggs]. Empty into a large bowl, and garther to form a ball. Dust your working surface with a little of the remaining flour, and place the ball on top. Knead and shape into two small rectangles, incorporating a litte more of the remaining flour if it feels to sticky. The dough should not be sticky at all. Place one of the rectangles in plastic wrap while you work with the rest so that it doesn’t dry out. 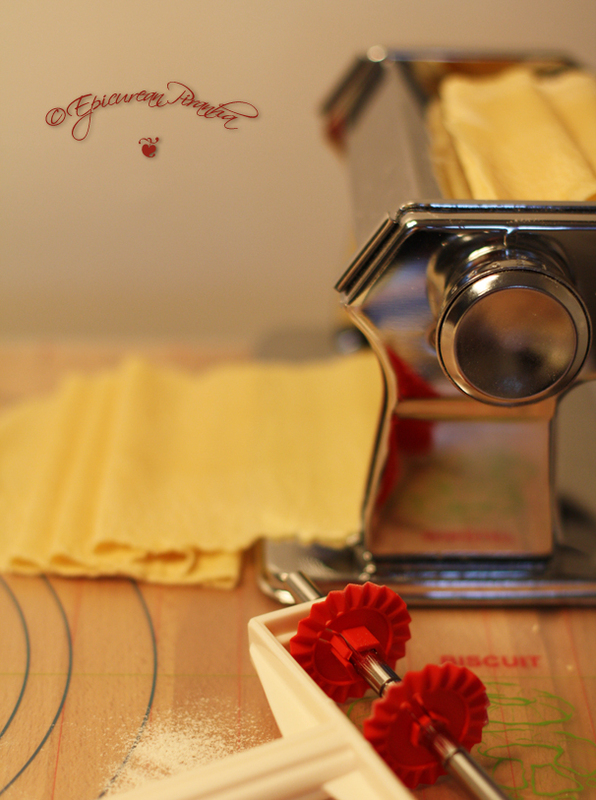 Set your pasta machine to the widest setting. 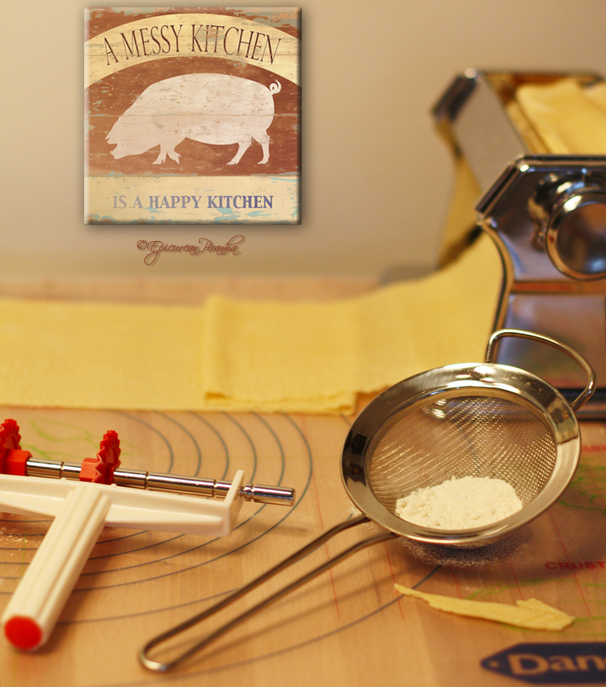 Take one of the rectangles of dough and start pushing it gently through the rollers of the pasta machine. The process of passing the dough through the rollers has the effect of kneading it. Turn it around and pass through this setting a second time. Now reduce the setting one notch and carefully pass the dough through again. Continue this process of reducing the space between the rollers, turning the dough around 180Â°, and cut it in half or in thirds when it gets too long, until you reach the finest or second to finest setting. Lay the sheets flat on a working surface and cover with a clean, humid, tea towel [teacloth] if you want to cut it into shapes or strips later, otherwise lay it on dry tea towels to dry. Before placing another layer on top [if you don't have sufficient space to spread it all out], dust lightly with flour. 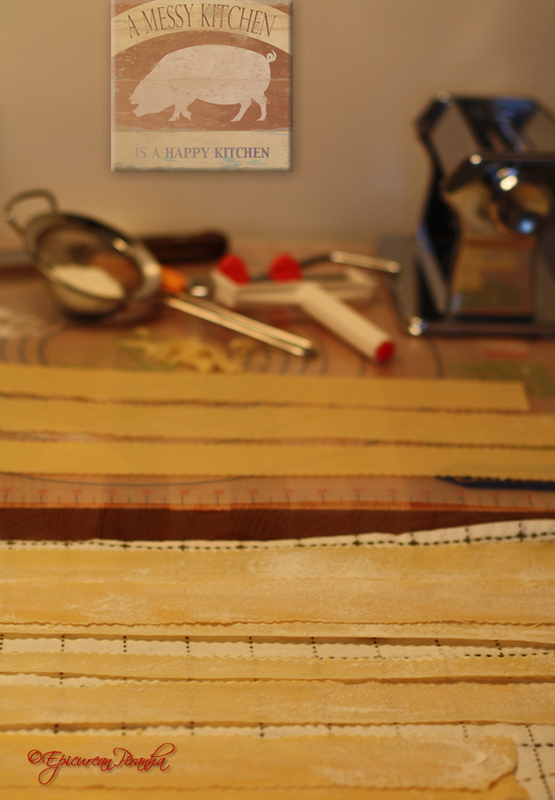 Cutting the strips into pappardelle, or ‘wide ribbons’. The name derives from the verb ‘pappare’, to gobble up! Allow the noodles to dry about an hour before cooking. Bring a very large pot of salted water to the boil. Add the noodles to the pot, and stir gently. As soon as the water returns to the boil, time it for 3 to 3 and a half minutes for thin sheets of pasta shuch as pappardelle, or 1 and a half to 2 minutes for tagliatelle. For stuffed pasta, they are ready when they float to the surface, a few minutes – make sure the water is only boiling gently, just a little more than a simmer, otherwise the pasta pillows may open! The thickness you make will depend on the type of pasta you are making. Personally, I prepare my pasta paper thin, so I always go to the very last setting. It will be a little more fragile to work with however. You make it sound easy, lol!! My grandma, though not Italian, used to make very fine egg noodles for soup…she rolled it out by hand! They were fabulous! I bet they were tender and delicious, and that her soup could cure any cold! Really, Sharon, this pasta is just so easy to make! The food processor and pasta machine do all the work. It’s only getting the dough through the rollers the very first time that’s a little difficult!